Our range of products include fryums production line, fryums making machine, gold finger machine, fryums processing machine, fryums snack extruder machine and snack pellet making machine. Fryums Production Line - As a new kind of top grade snacks, the potato starch extrusion food is rising instead of snacks. Executing unique extrusion & forming technology, natural model and close texture, taking corn starch and potato starch as the main raw material, the products of this processing line reach the best result of vision, smooth taste and integrity of snacks. Our fryums machine can make any type of shape such as wheels, alphabet, noodles and many more. We can use different type of raw material such as flour of wheat, mendo and many more. Our experts have specifically designed these machines in compliance with the prevailing industry standards using optimum quality materials. Furthermore, our machine is easy to install, make optimum performance and consume less power. We are well known manufacturer, supplier and exporter of gold finger making machine. This machines are made with industry standard and demand of gold finger machine is increasing day by day because of its modern design and high efficiency. We are prominent supplier & exporter of Fryums machine, so gold finger machine is another step towards the technical innovations. Our product line includes gold making machine, finger papad making machine, roll papad making machine, gold finger snacks, finger papad plant and many more. Gold finger is popular by different name that is (z) it is quite favourite among children especially who belong to the rural area. This packets are easily available in general stores and bakery. Gold finger is available in both the form fried and non –fried. Fried gold fingers generally packed in plastic and we can get from the general stores. Gold fingers are made from Maida flour and shape is like finger so it is very populous in children. Size of the gold finger contains 6mm to 350mm. gold finger is economical in market as compared to other food and Fryums product. First of all gold finger is economical product so everyone can afford it. And this is instant means ready to eat so demand is increasing day by day. · Easy operation so less manpower is required. · Due to minimum rate market demand is always high. Radhe Group is one of the well-known manufacturer, exporter, trader and supplier of an inclusive assortment of Fryums Making Machine. All our machines are fictitious using supreme quality machinery procured from the authentic and reliable vendors of the market. These machines are accessible in various technical specifications as per the needs of the clients. With enormous experience and knowledge we are involved in offering a premium quality range of Fryums Processing Machine. These are made according to latest trend using better-quality raw material and sophisticated technology. We offer various sizes and specifications as per the necessities of our clients. Besides, we also guarantee safe and timely delivery of our products. 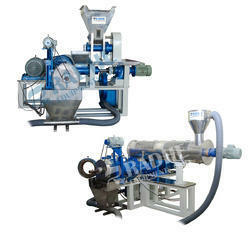 We are engaged in providing Fryums Snack Extruder Machine. Our team is having of in-depth knowledge professionals design and develop this extruder using supreme class raw material with the help of latest tools and technology. This is available in different disclaimer and can be customized as per the needs of clients. Offered machine is used to make different kind of snacks like cheeps and many more. Snack pellet machine is made to make various types of fryums. Potato starch, corn starch and wheat flour are used as main raw martial. And one production line through, we can make various shaped fryums like triangle, hexagonal and rectangle. Power consumption is low and we can get maximum production within short time. 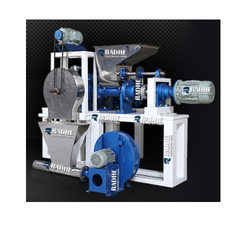 Radhe Group is leading manufacturer and exporter of a inclusive range of food extrusion machines. Our product portfolio includes of Food Processing Machines, Extruder Machines, and Fryums making machine. Our products are broadly patronized by our technical staff in the food industry and are highly regarded for their finest performance. To meet increasing demands of our precious clients, we are engaged in providing a wide scope of Fryums Snacks Extruder Machine that is manufactured using best grade components and leading edge technologies in accordance with set industry norms of quality. 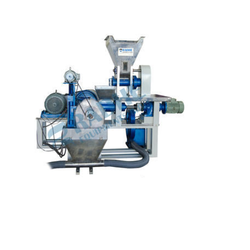 It is widely used in a variety of food processing units for extruding food items specially snacks. Our offered machine is rigorously tested on various parameters of quality assuring its overall performance. We are manufacturer, exporter and suppliers of fryums machine. We bring a qualitative assortment of Fryums Processing Machine that encompasses Snacks Making Machines, Noodle Making Machine, Roaster Machine, Mixing Machine, Industrial Dryer Machine etc. We are offering to our customers an excellent quality range of Fryums Machines, which are produced in high grade quality fryums (pellets). Our range of Fryums Machines can be availed at market leading price. In this modern time demand of the fryums is the most raising product in snacks as compared to other product. So we designed this machine observing the increasing demand of customers. 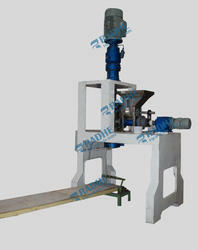 Our industrial fryums machine is able to grind any type of flour like whet, mendo and many more. And industrial fryums machine is highly automated which save energy and operational cost.